Yet again Halloween has managed to surprise me... before I knew what was happening it was only a week away and I had some last minute crafting to get done. Thankfully there is a fantastic pattern freely available on the Planetjune blog for these cute little pumpkins so after a bit of frantic crocheting I had these 3 finished and ready to start the Halloween celebrations. Photo thanks go to my lovely husband who has spent some time fiddling with his new SLR camera to capture these pumpkins in the middle of lighting candles. Seeing as the pumpkins really took very little time to make at all I also had time to make some very quick Halloween cards to go with them... just a few sheets of black sugar paper, some plain white printer paper and a silver pen and Bob's your uncle I had made some cards. 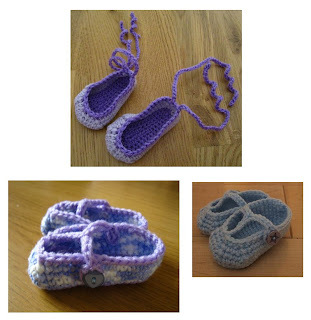 Just a quick post to show off a couple of crochet bits that are on their way to yet another new baby (for some reason there seems to have been a baby explosion recently so keep an eye out in case it starts raining babies too). 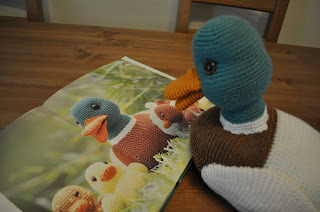 Orinoco is here again to show off my handiwork, you can see him wearing a deep ribbed crochet hat and some cuffed booties both patterns from the "Crocheted gifts in a weekend" book by Nola Theiss. The pattern for the hat was meant for an older child but after substituting the chunky yarn for a much finer yarn and using a smaller hook the hat should hopefully fit a newborn okay. The ribbing on this hat is lovely and adds a real thickness and warmth to the hat - this will definitely be a pattern that I try again in the future. Sadly the bootie pattern wasn't nearly as good. The cuffs were supposed to be knitted so the whole pattern was designed around that and required lots of sewing up of separate pieces. They have also turned out to be a little bit flat looking - not nearly as cute as they did in the book. Because of my crazy plans to try and craft most of the gifts that I will be giving away for Christmas this year I've gone and spent a lot of money on candles and new glass paint and now find myself slightly short on inspiration of what to paint... which is where Jane Dunsterville comes in with her lovely glass painting books. Back in 1996 when "The glass painting book" was originally published I was lucky enough to meet Jane Dunsterville at a craft show where she had a stand selling her then new book as well as her own range of glass paints. After spending quite some time gazing at the stall wishfully my mum offered to buy me a copy of the book with a starter kit of paints and that purchase started my love of glass painting. "The glass painting book" is aimed at beginners and starts out with advice about materials and then the first chapter contains some basic projects which introduce new techniques to help guide you gradually through starting off painting. 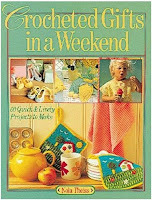 There is a chapter with projects that focus on using colour, a chapter for more advanced projects which introduces 'special' techniques and a final project chapter about painting on plastic. All the way through the book there are 'design directory' pages which have outlines that you can use to make all the projects listed as well as some variations to try. If you are starting out in glass painting and need some guidance about how to start as well as plenty of inspiration for things to make then this would be a fantastic book for you. "Glass painting projects: Decorative glass for beautiful interiors" is a more advanced glass painting book and geared towards doing large projects that will be on display in your home. There is much more detail about different techniques including guidance on using adhesive lead on glass panels, applying coloured adhesive (for projects that need to be more weather proof) and guidance on glass etching. The projects range from some lovely projects for painting panels on interior and exterior doors, lamps, some very beautiful painted mirrors and a whole host of other household glass surfaces that could do with making more glamorous. Most of the projects also seem to have a design style period and there are some lovely Art Deco and Rennie Mackintosh projects that I would love to try my hand at. This is a really beautiful book and the projects in here are awe inspiring, if you are thinking of taking your glass painting to the next level then this would be a great book for you to read. I've recently returned from a lovely 5 day break at a nearby Center Parcs which is the first holiday I've had since becoming a mum. 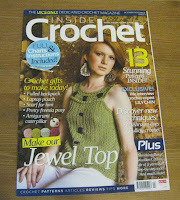 I'm now refreshed and ready to start knuckling down to my Christmas crafting, but before I got started on any of the things I have planned to make as presents I got side tracked by the frog hat pattern in issue 3 of Inside Crochet. This is a lovely pattern by Jane Bibby with simple instructions that you can use to make a variety of sizes (I'm very tempted to make a large hat for my husband but I don't think he would wear it). My little boy has been out a couple of times today wearing this hat and lots of people have stopped to admire him in it. Now I've made him a hat I should probably do him some matching booties as well though I may have to come up with my own pattern for them as there do not seem to be any that I like online. During my holiday I did try to get some crafting done in the one evening I had free so I had a go at silk painting, unfortunately it didn't work out quite how I had hoped... I found the outliner hard to apply and was unsure about how much was needed to stop the paint from leaking out of the outline. I also found that I can't draw butterflies freehand so next time I think I'll just stick to tracing someone else's artwork. The red smear at the bottom is my attempts at ladybirds, also not my best work. I'm hopeful though that I will do better next time with a little more preparation and thought - I may even be able to make a few more Christmas presents from my labours. For the last few days I've almost attacked my poor postman when he delivered our mail but failed to bring the latest issue of this magazine. Some kindly spirit must have been watching over him though as it has now been delivered and he is free from the threat of an anxious crocheter armed with a 3.5mm hook, at least for another two months that is. Why did I want this issue so badly? 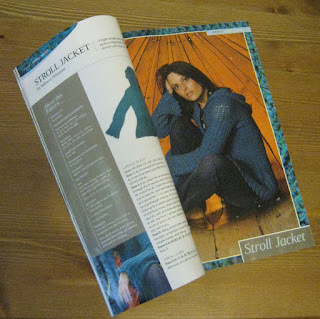 Well, at the back of the last issue was a photo of a 'Hooded stroll jacket' by Rebecca Velasquez which I have fallen in love with. I've never made myself a proper garment using crochet, (shawls and a poncho really don't count) and for the last year I've been thinking I need to stop worrying about messing it up and just have a go. This jacket would suit me so well, and I've gotten it into my head that I simply must have it, whatever the cost. As for the other patterns in this issue there are a lot that I really like, including a lovely felted backpack (and an article all about felting/fulling to help get you started) some lovely tops a couple of scarves (just right for the upcoming autumn months) and a cute scull laptop pouch by Rockpool Candy. The only disappointment was that I was expecting more amigurumi in this issue and all that was included was a rather lumpy looking caterpillar which was so basic it really didn't deserve to be written up as a pattern and I can't imagine anyone bothering to make it.